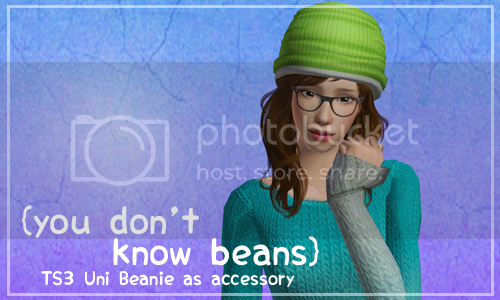 This is the beanie hat from a TS3 Uni store set -I think- that was dehairified by simsxolove@tumblr. I converted it to TS2. It's an accessory, so it can be used with all kinds of hairs. Well, some kinds of hairs to be honest, because it doesn't really work well with big poofy hairs. Anyway, it comes in 6 of Poppet's colors (swatch). The polycounts are actually pretty reasonable (FC 1376-VC 780). Hope you like it JSA! Have a wonderful day!